As always when it’s quiet around here, I’ve been busy. 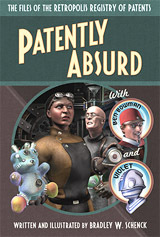 This time I’m working toward the book launch of Patently Absurd. And you can tell! In fact you can tell all over the place: at Amazon, at Barnes & Noble, and at many of the places where books hang out. The print and eBook versions of Patently Absurd are available for pre-order in lots and lots of places, as you can see at right. Review copies have gone out to those publications that have really long lead times, like Booklist and The Library Journal; I have two large piles of advance copies that are fated to go elsewhere (some to my Kickstarter backers, some to other reviewers, and some to booksellers). I have some smaller stacks of promotional materials and labels. Don’t even look at my dining room table. Please. The rest of the world can see the book on March 13 of next year. But, like I mentioned, pre-orders are now a possibility. For the print edition, I started out with a reduced price of $12.75 (that’s two dollars off the final price) but Barnes & Noble immediately marked it down again; so at the moment you can pre-order the book there for just $9.24. Don’t look at me: they’re wild and crazy over there. The Ebook pre-order price isn’t discounted anywhere, to my knowledge, but I may run a special for my own pre-orders at Radio Planet Books. We’ll see. Also, the book now has a presence at Goodreads for your adding and to-reading pleasure. Radio Planet Books will be selling the eBook editions (you can pre-order there now!) and I’m working on a way to sell the printed edition there, too. So these are exciting days for me and the UPS driver. I hope that yours are going well, too.